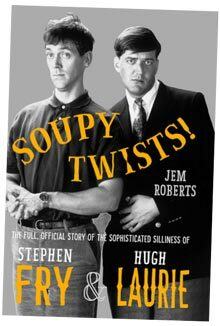 Sunday January 13, at 9pm, marks the 30th anniversary to the minute of the very first broadcast of series one, episode one of A Bit of Fry & Laurie To celebrate the auspicious marker, Stephen Fry and Hugh Laurie gave me their official backing for official joint biography Soupy Twists, which has been in shops (and also hopefully leaving them) since September. That seems like quite the cue for a party – cocktails and cabaret as we commemorate the comradely colleagues’ comedy. This timely celebration of Fry & Laurie’s classic show was originally completed in time for the 30th anniversary of the programme’s original pilot on Boxing Day 2017, but a year’s delay from Unbound Publishing still allows us to celebrate the 30th anniversary of Mr Dalliard, Tony, Control, Peter, John, Gordon, Stuart, Tidyman’s Carpets, Gelliant Gutfright and all manner of sophisticated classic sketches. As a schoolboy, one of life’s greatest pleasures was to stand in front of the class in the school library and read from one of Stephen and Hugh’s script books with a little friend. Now, thanks to Chortle, I’m preparing to do the exact same thing at THE BRITISH LIBRARY! Not content with giving permission for the official book, Mr Fry has provided his personal blessing (with tacit blessing from Mr Laurie, who is naturally so hands-off his hands are positively in another zipcode) for us to bring huge wedges of ‘unseen’ Fry & Laurie material to life as part of the Chortle Book Fest on the very day of the 20th anniversary at the British Library in January. When I first became a comedy historian, I was fuelled purely by love for I’m Sorry, I Haven’t A Clue, and a certainty that if I didn’t do something, a typically fusty book by an egotistic author, missing the point of the show and ruining all the gags, was an inevitability. But with 50 years of comedy to cover, listening to every single available episode of ISIRTA and ISIHAC, the last thing I needed was extra rare material. It wasn’t until researching my second book, The True History of the Black Adder that a visit to Richard Curtis’ Notting Hill office (yes, it was exactly like stepping into one of his films) ended with him handing me a freshly printed copy of the the Blackadder Christmas Special that wasn’t, Blackadder In Bethlehem. And when my next book, The Frood, earned me the honour of becoming Douglas Adams’ official biographer, I also wasn’t expecting this to extend to being the very first writer allowed to explore the wonders of the Adams Paper Archive in Cambridge, which yielded masses of unpublished material, the cream of which (including chapters from the abandoned version of Life, The Universe and Everything and scripts for the unmade Hitchhiker’s Guide TV series 2) ended up in the book when it was released in 2014. There was, of course, a lot of thought put into the moral quandary of posthumous publishing by everyone involved, but really our decision was made for us by Douglas, who was proud to write the foreword to his literary heroes posthumous release, Sunset at Blandings, which PG Wodehouse died while composing. Anyone who loves comedy should share this horror, of great jokes being hidden away, available only to the most dogged researchers, at best. If there are laughs to be had, they are surely best aired and gained anew, rather than leaving funny stuff in the archives. 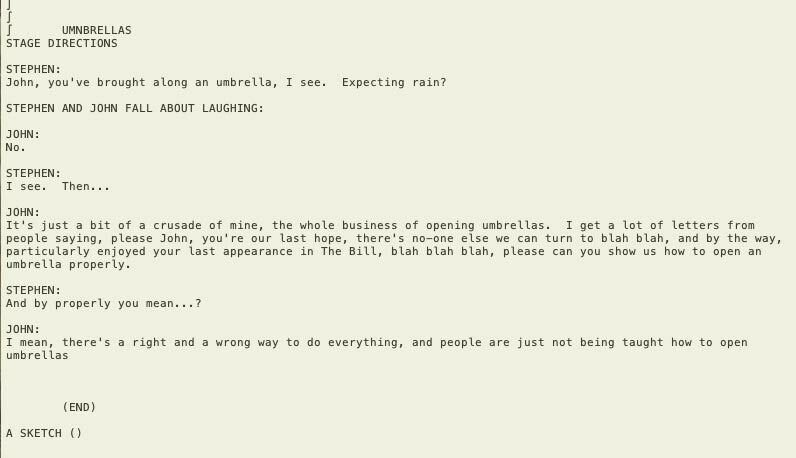 Paul and I will be doing our best to give the jokes new life. And so, we two colleagues will be performing snippets from both the lost Blackadder episode and the Hitchhiker’s Guide archives for the Chortle Book Fest – but above all, of course, we will be paying tribute to Stephen & Hugh with a load of Fry & Laurie sketches which have never seen the light of day before. There was obviously no moral quandary with including the lashings of unpublished Fry & Laurie comedy in Soupy Twists, as it was Stephen Fry himself who emailed me the download link to his entire ABOF&L database after our preliminary lunch which secured the book’s existence. But within the book, and in this show, you will find the cream of the sketches Fry & Laurie never got to put on stage nor screen – and believe me, this is material which any sketch outfit of the last 25 years would slaughter all their family in ice-cold blood to get hold of, and perform. There must be a minimum of three or four hours – certainly a whole unmade ABOF&L series’ worth – of material here on my hard-drive to choose from. Paul and I, abetted by the brilliant Samantha Béart and Toby Longworth, performed a whole hour of ersatz ‘unseen’ ABOF&L at the London launch last September, but we promise fresh surprises at the British Library at 1.45pm on Sunday January 13. 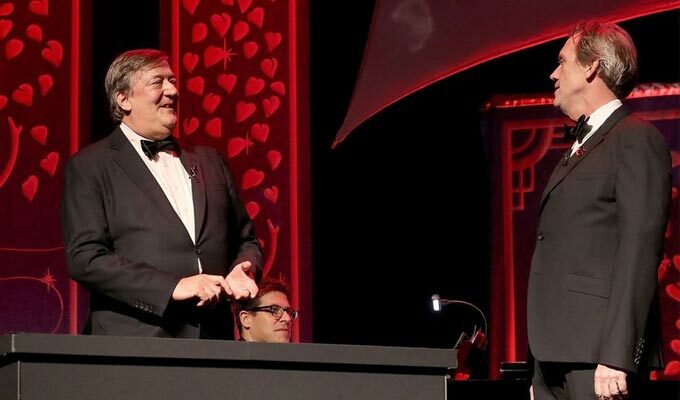 Not only that, but an entirely separate sequel hour of unperformed Fry & Laurie material has, also with Stephen’s express permission, been put together for a second cabaret show in Bath that very evening. I’ll be ‘doing a Phil Collins’ (no, not leaving my wife via fax, but travelling across the country for two linked gigs) after the Chortle event for an exclusive cabaret in Bath’s Walcot House at 8pm, complete with sketches, songs, and a specially made ‘Soupy Twists’ cocktail. With the 30th finally celebrated, the grand task of celebrating Fry & Laurie’s uniquely sophisticated brand of silliness will finally feel complete – bar a paperback release next autumn. But then, who knows how quickly the book may be out of date? Just after Soupy Twists hit the shops, Stephen & Hugh reunited for the first comedy sketch this decade for a charity event. Admittedly only the well-worn ‘hedge sketch’, so nothing new, but perhaps it may be a sign of an autumnal lap of honour for the colleagues, at last. But until any word comes on their live reunion, we’ll be offering you the very best thing. Chin chin, bottoms very much up, and naturally, Soupy Twist! • Jem Roberts is a comedian and comedy historian. His new book Tales of Britain, the first British folktale collection to be published in 30 years, is published by Unbound next month.